A hero and a soldier, too, they buried him in lime. Upon his wedding-morn they slew, a lover in his prime. Into a burning ditch they threw, a poet and his rhyme. 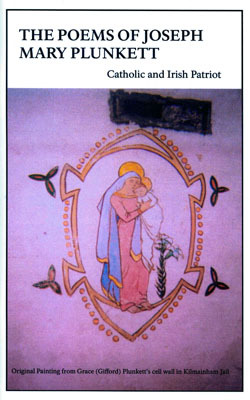 The almost unbearable beauty of the love story of Joseph and Grace which encompasses not only their own love for each other, but also their love of God and of Ireland, has fascinated me for many years. The story of that love is told most succinctly and beautifully in the poem by Father Feeney at the beginning of this book. But there is much more to the story than that. 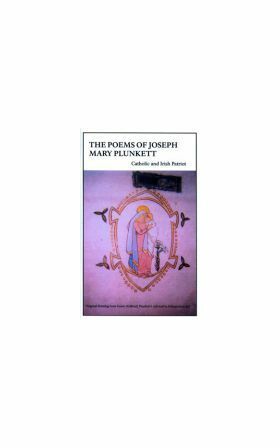 Plunge yourself into the beauty and mysticism of the poems of Joseph Plunkett, the Military Commander of the Easter Rising and youngest signatory of the Proclamation of the Irish Republic who stood with Pearse, McDonagh, and Connolly as they cast their fates upon the cause of freedom for Ireland. A famous priest once said that other than those committed to the life of religion, the two types of persons most likely to save their souls were poets and soldiers. Joseph Mary Plunkett was both. And wondered which to wear. Or black for her despair? She saw a laughing bride. She heard a curlew wail. The door of Richmond jail. She smote it with her hand. And be their wedding bell. And cheered this drooping bride? Last hour before he died? And then he passed along. And bound it with a thong. And Ireland lost a song. They buried him in lime. A lover in his prime. A poet and his rhyme. With brute and knave and churl! For eye with the Gifford Girl! Joseph Mary Plunkett was the son of Count and Countess Plunkett, and was born in Dublin in November, 1887. He attended the Catholic University School and Belvedere College, but his wide reading did more to educate him than any schools. He followed the two years Philosophy course at Stonyhurst College when he was eighteen. This made a strong impression on him. He kept up the study of Scholastic Philosophy and was very much influenced by mystical contemplation or loving inclination towards God. The books that were his most constant companions were St. John of the Cross, St. Teresa, St. Francis, and John Tauler. Their mark on his poetry is very plain, though, as his short article on Obscurity and Poetry will show, he would apply the term “mystic” to but a very small part of his own verse. He showed me two or three poems that he called mystic, but I cannot find these now and must presume them destroyed. Of course he employed the symbolism of the mystics broadcast. He was obliged by ill health to spend a great deal of his short life in inactivity and to winter abroad. He and his mother spent a winter traveling in Italy, Sicily and Malta, where he had a good friend and another winter was spent in Algiers with a sister, where he studied the Arabic literature and language, enlarging his range of images by what he found there, though it is curious that the only poem which is purely Arabic in imagery is the short poem, “It is her voice that dwells within the emerald walls and sapphire house of flame,” (title from The Mistress Of Vision by Francis Thompson.) which he wrote before he went to Algiers. I also think it possible that the queer, flamboyant and melodramatic happenings which there came his way may have colored that part of his verse which is more unrestrained and violent than the rest, for instance some of the sonnets in Occulta. Before he went to Algiers he had met Thomas MacDonagh, who was teaching at St. Enda’s School, Rathfarnham, which he had helped P. H. Pearse to start. My brother wanted someone to teach him Irish for the matriculation of the National University and Thomas MacDonagh taught him for some time, and when he discovered my brother was a poet I think there was more poetry than pedagogy in their relationship. The Circle and the Sword was published in 1911, the year my brother was in Algiers. Thomas MacDonagh made the selection himself from my brother’s poems, and saw the book through the press. Although there are a good many immature and defective poems in it, it is rather remarkable for a first book. The lyric, “White Dove of the Wild Dark Eyes” would be difficult to surpass on its own ground; the sonnet “I Saw the Sun at Midnight, Rising Red,” the poems “1867,” “I See His Blood Upon the Rose,” “My Soul is Sick with Longing,” and “The Stars Sang in God’s Garden” are all above the level of first books. I have included these and a few others which I thought worthy in this book, as I know he wished only these few to be considered as part of his mature work. When he returned from Algiers he had a house of his own in Donnybrook, where we kept house together for two and a half years. With the exception of P. H. Pearse and Thomas MacDonagh he had few other literary friends in Dublin up to the time he became interested in the Irish Review. This was started by Professor Houston in 1911, in association with James Stephens, Thomas MacDonagh and Padraic Colum. Mr. Houston edited it himself for some time, and Padraic Colum was editor in 1912–13. Two poems of my brother’s were printed in it; he got to know the people who were associated with it very well, and in June, 1913, he became editor himself. Any cause he was interested in was discussed in the Review; for instance, the men’s case in the strike of summer, 1913, and the Volunteer movement from November of the same year to the date of the seizure of a large number of copies of the Review by the police in London in November, 1914. Joseph Campbell, Conal O’Riordan, James Cousins, Lord Dunsany, Darrell Figgis, Arthur Griffith, Mary Hayden, W. M. Letts, Susan Mitchell, Seumas O’Sullivan, M. A. Rathkyle, Frederick Ryan, Sheehy Skeffington, Jack Morrow, John MacNeill, Peter MacBrien these, with Thomas MacDonagh, James Stephens, Padraic Colum, P. H. Pearse, Edward Martyn, and David Houston are the names of the goodly company who were constant contributors to the Review. Sir Roger Casement, who was my brother’s intimate friend, had written articles for the Review when Padraic Colum was editor, and continued to write in prose and verse for my brother. The Review was not in good financial condition when it came into his hands, and as he had not sufficient capital to put it properly on its feet, he just kept it going in the same way as he found it until the police seizure in London, which I have mentioned, made the loss too great for it to be carried on any longer. From the time we were in Donnybrook, Thomas MacDonagh and my brother lived and worked in close relationship. Apart from the Review they criticized everything each of them wrote in the most vigorous way, and to them criticism was an exact science. My brother published Thomas MacDonagh’s Lyrical Poems, and they were both keenly interested in the printing and form of the book. He also published P. H. Pearse’s Suantraidhe agus Goltraidhe. The Irish Theatre was started in 1914 by a partnership consisting of Edward Martyn, Thomas MacDonagh and my brother. Its purpose, as opposed to the purpose of the Abbey Theatre, was to produce Irish plays other than peasant plays, plays in Irish, and foreign masterpieces. They played periodically in Hardwicke Street, and produced plays by Edward Martyn, Eimar O’Duffy, John MacDonagh, Tchekoff, etc., and have been on the whole very successful in carrying out their objects. Towards the last six months my brother disagreed with the other directors for not abiding by the spirit of the agreement, and definitely dissociated himself from the Theatre on the production of Strindberg’s Easter. The Irish Theatre is still in existence and is being carried on by Mr. Martyn and Mr. John MacDonagh. The first section of this volume, Occulta, was to have been my brother’s next book. He arranged it himself in the order in which it now stands, wherein the sequence of thought is unbroken. I have gathered together in the second part his later verse and those earlier poems which he would have considered worthy of republication, including those from The Circle and the Sword. Many of his poems have been destroyed, or at any rate are irrecoverable, and these poems of the second section are fragmentary and disconnected—but I have not included in this book anything I think he thought second rate, and have omitted a fairly long poem that I am sure he intended to be left out. He had outgrown all tours de force, all false standards, and gone to the desperate simplicity which is so hard to reach. Though my brother and Thomas MacDonagh differed widely in their methods of writing, their critical standards and judgments were alike. In the article Obscurity and Poetry, reprinted here, there is a great likeness to the character of Thomas MacDonagh’s last book, both in the matter, that is in the aspects of the subject discussed, and the curiously painstaking method of discussion, due, I believe, to the fact that they were dealing with what was to them an exact science for which they had no exact terms. Their spoken criticism also had the same characteristics—both of them as quick to construct as to destroy, to praise as to blame, not sparing in either, though Thomas MacDonagh was the more severe of the two. There are a few verses, which, while out of place in the text, I do not care to omit, and there is one ballad, better than either of these which follow, that it is perhaps too soon to publish. The ballad (of the “Foot and Mouth” is an extremely good imitation of the old topical ballad, with all its beautiful badnesses. It is sung to “The Groves of Blarney”. Her cheeks down streaming with the signs of woe. In manner decent with never a smile. What is my danger at the present time. With detention orders that raked him sore. For the beasts have diseases of the foot and mouth! The Cloven Hoof and the Dirty Tongue. For the lad that’s courting me to be his wife? That their life is humdrum with but little fun. Both the stars and the crescent in graciousness. With her easy smiling while—he stopped her breath. And send them dancing to Paradise! Beauty and Truth, Faith, Hope and Charity. Silence comes over the sky.